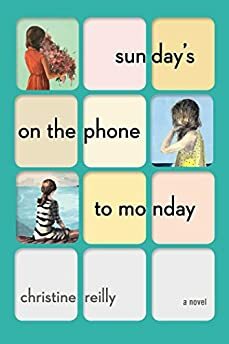 Largehearted Boy: Book Notes - Christine Reilly "Sunday's on the Phone to Monday"
Book Notes - Christine Reilly "Sunday's on the Phone to Monday"
Christine Reilly's novel Sunday's on the Phone to Monday is a lyrical debut debut with themes of family, love, and loss. "A lyrical, and lyric-filled, portrait of a family in love and sorrow. This whimsical, bittersweet debut novel recalls the work of filmmaker Wes Anderson... the focus is on three Salinger-esque siblings... there is something iridescent about this novel." Sunday's on the Phone to Monday follows Claudio and Mathilde Simone, once romantic bohemians hopelessly enamored with each other, find themselves nestled in domesticity in New York, running a struggling vinyl record store and parenting three daughters as best they can: Natasha, an overachieving prodigy; sensitive Lucy, with her debilitating heart condition; and Carly, adopted from China and quietly fixated on her true origins. A "Muzak" version of this song plays during Claudio and Mathilde's first date at a restaurant. Everyone's heard this eponymous song, written originally for an unsuccessful Broadway play called The Great Magoo but which has endured from recordings by popular artists during the last years of World War II. My favorite rendition is Ella Fitzgerald's. This might be my favorite song, and I felt sorry reducing it so in the scene, but I wanted it to show its face in a small, lasting way. Some authors have tiny cameos as extras in movies whose screenplays are based on their books. I wanted the song to have a similar secret effect on Sunday's on the Phone to Monday. I grew up in the 90's and early "noughties", but I have always loved The Smiths. (One summer I encouraged my best friend in high school to cut her own hair, Morrissey-style.) As a kid I developed a party trick of forcing myself to cry on cue. It worked for me during school play tryouts, but then I did it to such a degree often the hysterical crying would turn into hysterical laughing. Thank you, the Smiths, who taught me how much fun self-pity can occasionally be. Abbey Road Medley – Songs on the B-Side of Abbey Road, from "You Never Give Me Your Money" until "Her Majesty"
Abbey Road was the last album the Beatles recorded, and they once divulged that they created this to "use up" a bunch of incomplete songs, resulting in my favorite consecutive nine music tracks of all time. I saw Paul McCartney twice in concert, who concluded both sets with "Golden Slumbers" into "The End," and both times, I cried. I'd argue that "Her Majesty" is the perfect ending, for its entropy in the scope of the album. "Her Majesty" gives the Beatles arbitrary immortality. I've had fun telling people the title of my book, figuring out who's a Beatles fan. It's my favorite litmus test! This is my favorite love song. I thought about playing this song at my future wedding, but I didn't want to sadden people. I understand that many people view this song as miserable even though I see it as hopeful. Maybe you could say the same thing about my novel. If I'm ever asked to DJ a party (which I am sometimes, for some reason), I always start with this song. I love this entire album. Biggie is an epic lyricist, but had a difficult tightrope to walk: if he mentioned his wealth, he was accused of denying his past, but if he rapped about poverty, he was denying his present. I deem his lyrics to be mostly about how he's been the same person in both stages of life. I will always have a small, soft spot in my heart for old Broadway musicals. I remember downloading this song from Limewire (was it Morpheus or Kazaa?) on the morning of my sixteenth birthday. Please don't think I'm as literal as I've made myself out to be. There's a line in my book about how depressing it may be when bands tour after so many years but need to rechristen themselves because original members have died, or left. Creedence Clearwater Revival is an example of this, whom I actually saw in 2007 as "Creedence Clearwater Revisited." I'm still happy I saw them. They were awesome, and made me feel very melancholic indeed for the passage of time.